Preheat oven to 350°. Lightly oil the skin of the squash and place on an oiled baking pan. Bake 45 to 50 minutes until tender. Remove from the oven. 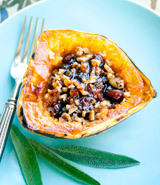 Sprinkle an even amount of walnuts and cranberries in the hollowed out portion of the squash were the seeds were. Drizzle 1 to 2 tablespoons of syrup over each squash and serve.